Robert Barnes crew was assigned to the 513th Squadron. Standing: Bob Barnes - Pilot, Don Trott - Co-Pilot, William Farwell - Bombardier, Bill Smith - Navigator. 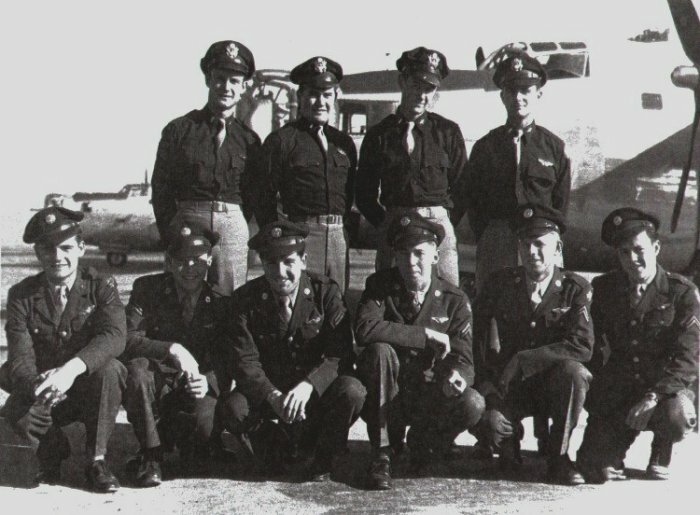 Front row: Jack Fleming - Ball Turret Gunner, Bob Klingbail - Tail Gunner, Manuel Reisner - Nose Gunner, Bob Solberg - Top Turret Gunner, Ed (Frank) Suttle - Engineer, Warren Johnson - Radio Operator.